Dale hams for the camera at the Block Party in 2007! Disney Memories 2007. The trip we took in 2007 was our first trip ever where we stayed on Disney property, and we were guests at Coronado Springs. We loved the resort! It was great, and we had a lot of fun staying there. So much so, in fact, that we stayed there in 2008 also! The picture at the beginning of this post is from one of our favorite memories all time, not just for 2007. In this photo, we were at the Animal Kingdom Park for evening Extra Magic Hours — something they don’t do anymore! On this particular visit, we were fortunate because we came upon the Block Party that they were having over in DinoLand, U.S.A., and it was so much fun! 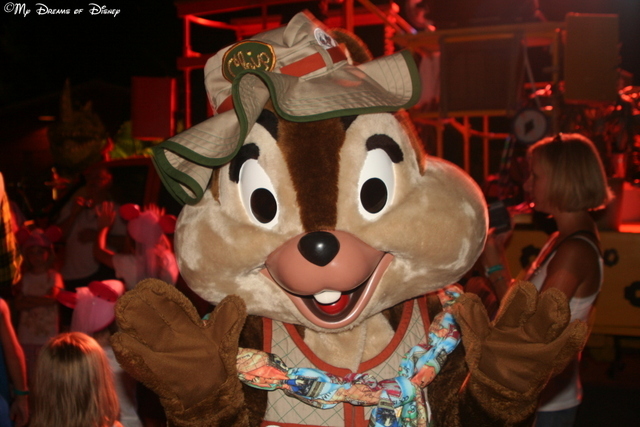 Sophie danced with Chip and Dale and Goofy, got autographs, and it was just a lot of fun! 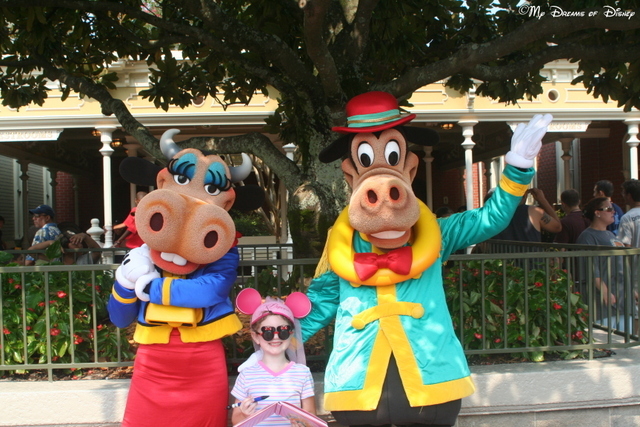 Clarabelle Cow, Sophie, and Horace Horsecollar pose for the camera! For me, the things that are my favorites from this trip are the great character shots that we got with Sophie. In the picture above, Sophie is posing with Clarabelle Cow and Horace Horsecollar, a set of Disney Characters that you just don’t see in the parks very often! In addition, we’ve got Sophie with Minnie Mouse, Sophie dancing with Donald Duck, and even shots of Sophie with Mickey & Donald at Chef Mickey’s! Minnie & Sophie — love how Sophie’s leg kicks out! 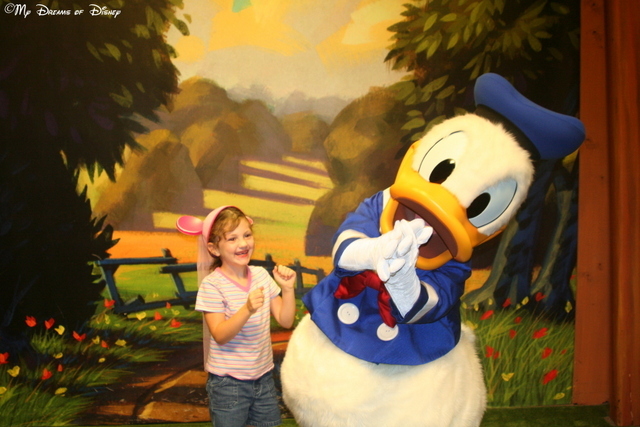 Sophie was so excited to see Donald Duck, she started dancing! 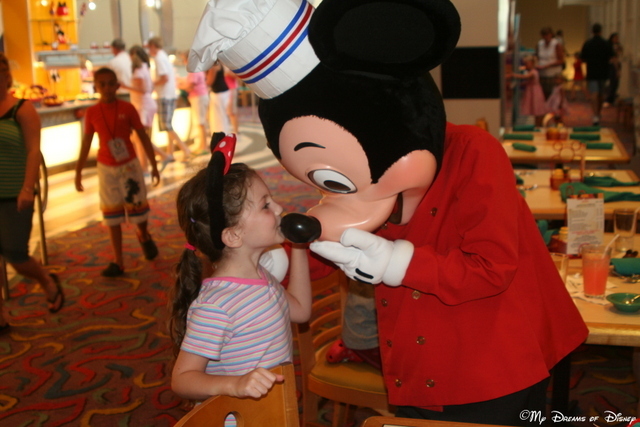 Sophie kisses Mickey’s nose over at Chef Mickey’s restaurant! 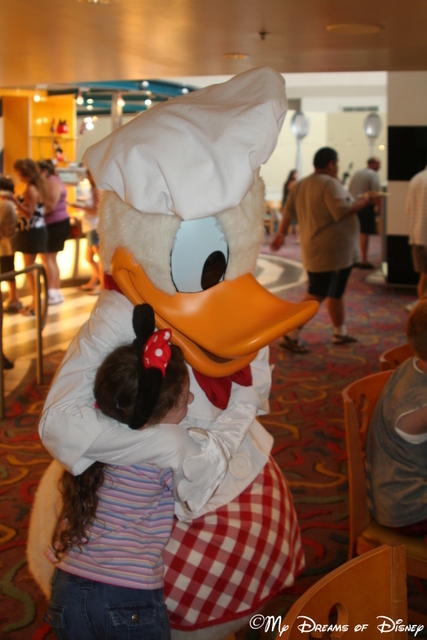 Sophie hugs on Donald Duck at Chef Mickey’s! Goofy & Sophie sharing a special “Ear” photo! Like me, Cindy has many memories from this trip that stand out. 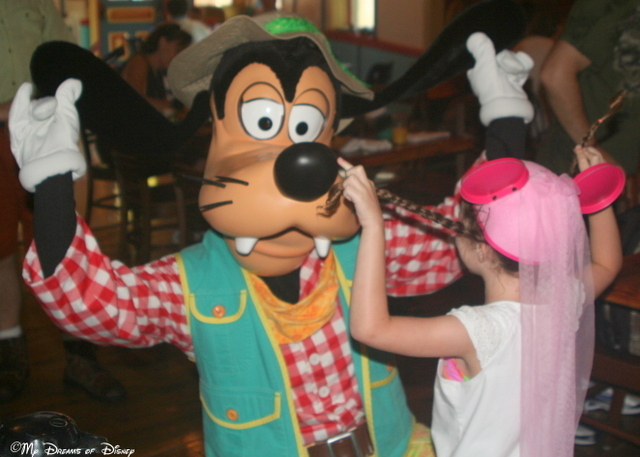 Among them are the block party that we talked about at the beginning, the breakfast that we had at RestaurantSaurus with Mickey, Donald Duck, and Goofy — and this picture of Sophie and Goofy comparing pigtails and ears! Sophie loved this spot in DinoLand, U.S.A., when she could dig all she wanted! For Sophie, there are a lot of memories of this trip, and all of the ones that we’ve listed previously are ones that she enjoyed as well. However, one thing that we haven’t talked about that Sophie really loved was the Boneyard at DinoLand, U.S.A.! 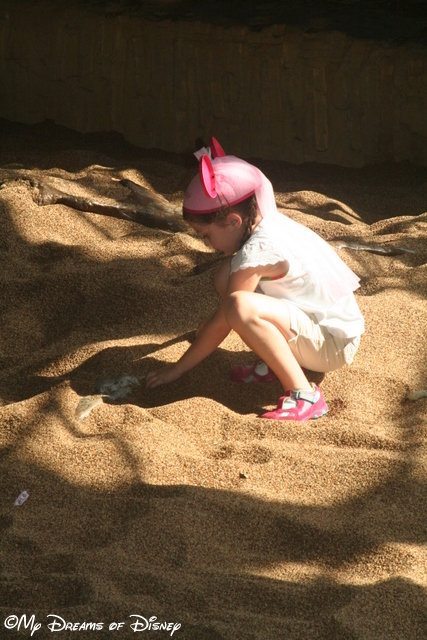 This special area is a place to dig for dinosaur bones, and Sophie loved playing here. Thank you for taking the time to relive our memories from our trip in 2007. 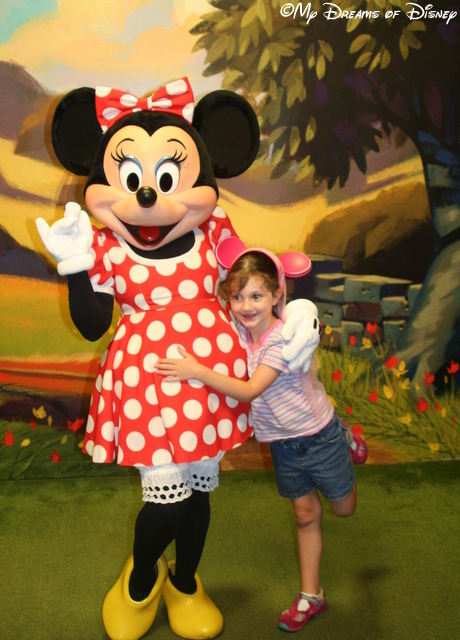 What are your favorite Disney memories from your trips? 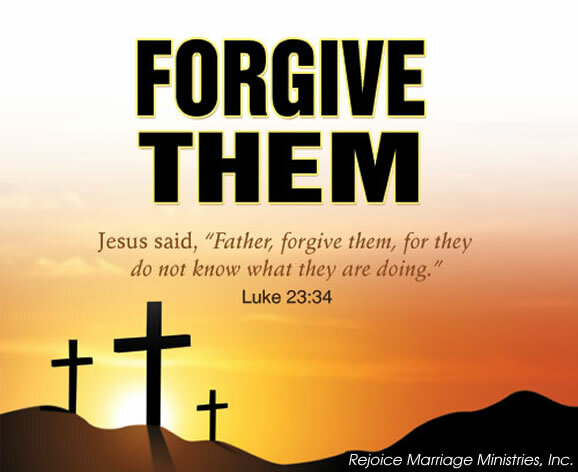 Let me know in the comments, and thanks for visiting today!